Peter Lacey will always be known as one of the greatest surf lifesaving competitors of all time. Whilst his record shows a seemingly endless list of championship victories that would justify this recognition, it was Peter's unsurpassed longevity at the very highest level of competition that sets him apart from anyone else in the sport. In 22 successive years of competition at the Australian Surf Lifesaving Championships from 1963-84, he won 18 gold, 19 silver and 10 bronze medals. He collected at least one medal every year, with his first gold medal coming in the Junior Belt Race in 1964 and his final gold medal 21 championships later, in the Senior 4 Man R&R event. 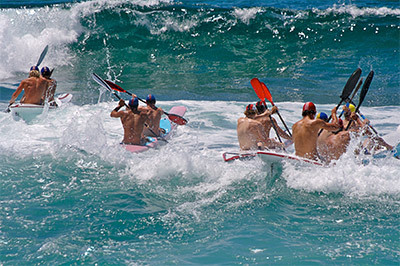 He won 4 World Surf Lifesaving Championships, two at South Africa in 1973 and two more in Hawaii in 1983. From 1983-85, he was the Australian representative team coach of an undefeated Australian Surf Lifesaving Team. One of the highlights of the 75th anniversary celebrations of Surf Lifesaving in Australia was when Peter, Ken Vidler (Scarborough WA) and Steve Warren (North Cronulla NSW) were all named equal greatest Australian Championship Competitors in the sport, ever. From 1991-94 Peter competed internationally in the World Masters Surf Lifesaving and Games event, winning a further 16 gold and 6 silver medals. Peter first joined Surfers Paradise Surf Lifesaving Club with the encouragement of fellow club member and swimming coach, John Carew, in December 1960. Regarded as little more than an average swimmer at his school, he met with early success in the surf. He won the cadet surf race in his first club championships, only to learn he could not accept the pennant because he was yet to obtain his first, basic surf life saving qualification - his qualifying certificate. Determined to follow up his early promise, Peter began to train with enthusiasm and became the Club Champion for the next 10 consecutive years. Peter went to compete with 3 other clubs, Lorn SLSC (1971-74) and Southport SLSC (1979-85) before returning to Surfer Paradise.